Heat oven to 300°F. Bake about 30 minutes or until set but not brown. Remove from cookie sheet to wire rack. Apples: Mix red or green food color into part of dough. Shape into small balls. Insert small piece of cinnamon stick in top for stem end and whole clove in bottom for blossom end. Dilute red or green food color with water and brush over apples. 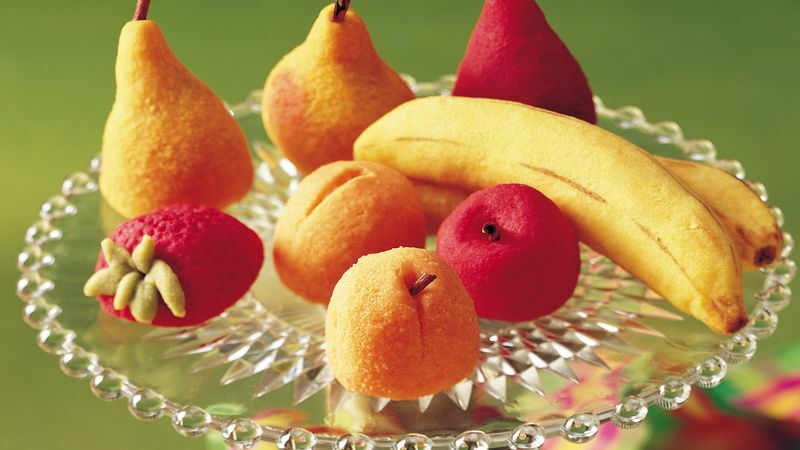 Apricots: Mix red and yellow food colors into part of dough. Shape into small balls. Make crease down 1 side with a toothpick. Insert whole clove for stem end. Dilute red food color with water and brush over apricots. Bananas: Mix yellow food color into part of dough. Shape into 3-inch rolls, tapering ends. Slightly flatten sides to make planes of banana; curve slightly. Paint on markings with mixture of red, yellow and blue food colors diluted with water. Oranges: Mix red and yellow food colors into part of dough. Shape into small balls. Insert whole clove for blossom end. Prick with blunt end of toothpick for texture. Pears: Mix yellow food color into part of dough. Shape into small balls, then into cone shapes, rounding narrow end. Insert small piece of cinnamon stick in narrow end for stem. Dilute red food color with water and brush on "cheeks" of pears. Strawberries: Mix red food color into part of dough. Shape into small balls, then into heart shapes, about 3/4 inch high. Prick with blunt end of toothpick for texture. Roll in red sugar. Insert small piece of green-colored toothpick or green dough into top for stem.